I am headed back to the Middle East this spring and Dubai will be a new destination for me! I wanted to get a head start on fun things to do in Dubai so enlisted an expert. This is a guest post contributed by Arzo. The world is full of wonderful places and to be honest, I have several favorite places in the world, but one of my very, very favorite places is Dubai in the United Arab Emirates as there is so much to do! Dubai surprised me – I would never had thought I could like it so much. With each trip to Dubai (which I visited first as a stopper destination only) my love has grown and if you give Dubai a chance you might fall in love as well. As a solo female traveler I love the safety, cleanliness and the ease of getting around. Though it has an Arabic touch, it is quite westernized which makes it easy for travelers from Europe or the USA. This includes the fact that there is no very strict dress code compared to other Islamic destinations, but keep in mind that you should follow the law in the United Arab Emirates strictly! 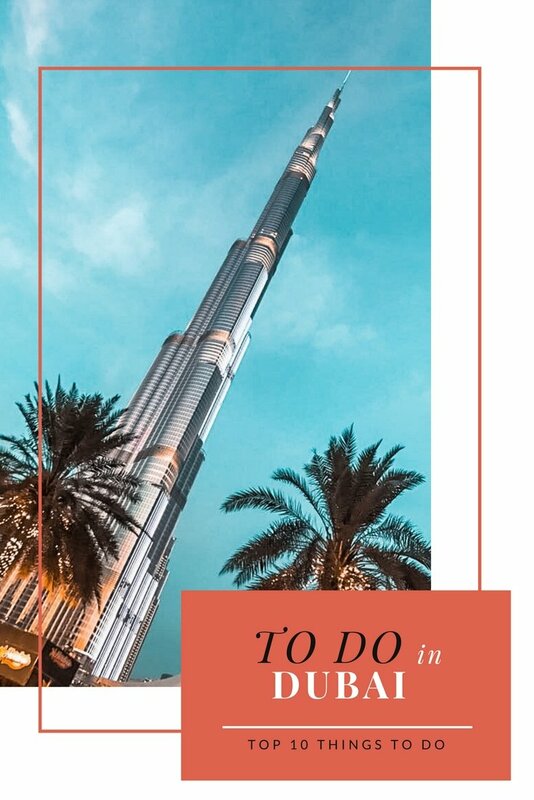 Sure, I am not a big fan of the prices for accommodation, and Dubai on a budget is not always easy, but not impossible, but apart from that, Dubai is a place I truly recommend to visit and here are my Top 10 Things to do in Dubai. If you are in Dubai you need to visit the Gold Souk – it is located in Deira, the old part of Dubai and there is gold, a lot of it. Even if you do not have a budget to buy tons of gold, it is worth a visit – you will find other shops that sell affordable and traditional Arabic clothes as well. Burj Khalifa is a great place to visit and one of the top things to do in Dubai . If you are scared of heights you should not visit the top to enjoy the view, but you can still admire it from far – after all, this is the biggest building in the world standing at more than 800 meters. Jumeirah Beach is the best place to visit in Dubai if you like to unwind. The public and free beach is clean and pretty and comes with a great view of Burj al-Arab. After all the hustle and bustle a day at the beach does not harm, right? Another lovely area, which offers great views of Burj al-Arab is Madinat Jumeirah. This area is designed in an Arabic style, and is one of the best places for nice strolls. You can see the most expensive hotel in the world from there, the Burj al-Arab, or just get lost! Shopping in Dubai is surely a great experience as you…´ll find the biggest malls in the world in Dubai. The biggest of all is the Dubai Mall – it is more than a mall and includes aquariums and many more things.… Even if you do not shop the mall, it is next to the Dubai Fountain and Burj Khalifa so you should at least take a peek! 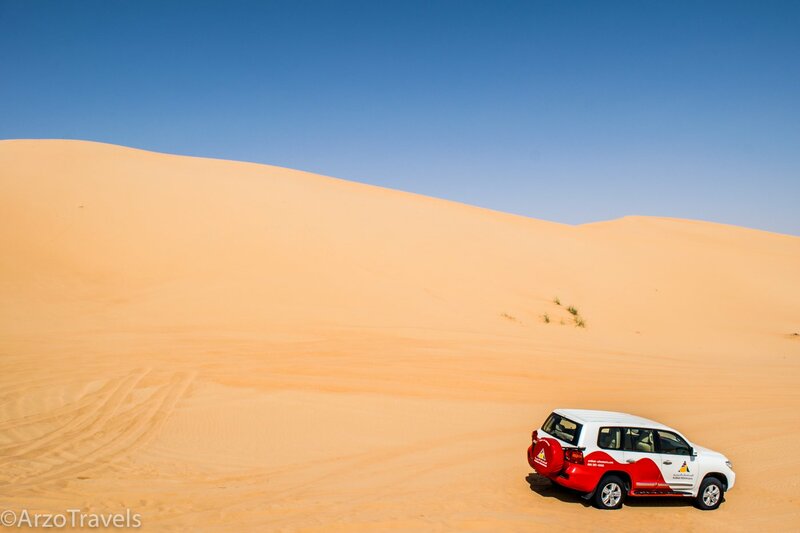 In Dubai, a desert safari is a must-do activity. Whatever tour you opt for it is surely one of the highlights of each Dubai trip. A dinner in the desert, to very fair prices, should be on you itinerary and it will be a night to remember. Dubai Marina is a great place to visit – at day or night. It is one of the best places to crop off the day – with a drink and awesome views of the amazing skyscrapers. Dhows are the traditional Arab boats that you´ll find in Dubai and which are fun to explore Dubai with. You can do an 1-hour boat cruise or spend a whole evening on the dhow. Consider dinner on the boat as well. When you are planning your visit to Dubai, you will want to know what to buy in Dubai. If in Dubai, you should visit the Atlantis Hotel on the Palm. The luxury hotel is home to several tourist attractions, like the Lost Chambers or a huge waterpark, but strolling through the lobby is also an interesting thing to do. You will find out that the standard of hotels in Dubai is very high! Another place to visit is JBR The Walk. The place is not far from the Atlantis Hotel on the Palm with free beach access, street art and cute cafes and restaurants. If you are looking for a review of the Unlimited Pass, check out this review of which pass to buy from Ricky on Bus Bus Tours. This is a guest post written by Arzo. She runs the travel blog Arzo Travel and mostly travels the world solo. While she still works as a teacher (part-time) she tries to travel the world as much as possible and discover new places each time. Switzerland and Dubai are the main focus of her blog. sweet thanks for the recommendation! Im going to Dubai(and hopefully Abu Dhabi) for the first time. As a solo female traveller safety is very important to me, so Dubai seems like a great destination. I am living in Dubai and no doubt it’s a good place. That’s why I recently started blogging about Dubai travel.